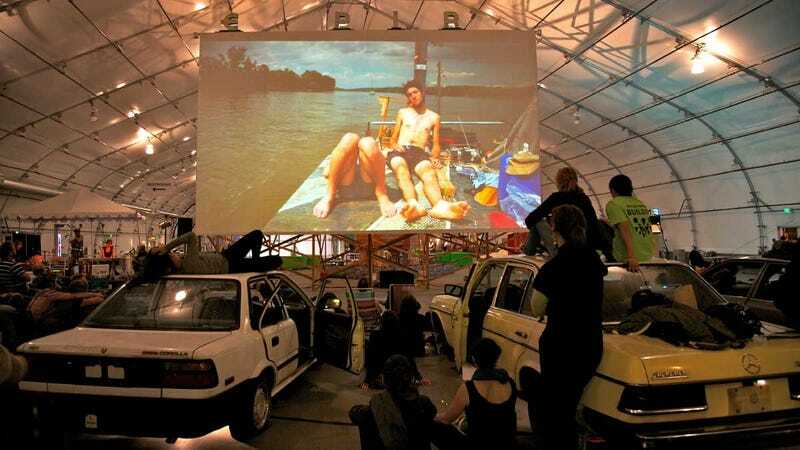 For two artists, it wasn't enough to merely display their films on a screen in a museum, so they turned 25 soon-to-be-scrapped cars into the seating for a custom-built theater that looks like a drive-in after a Soviet thermonuclear attack. The display space is called "Empire Drive-In" and is setup in the South Hall of the San Jose Museum of Art. There's a screen made up mostly of reclaimed wood and all the cars are equipped with receivers playing audio projected over low-power radio. And just like at a real drive-in there will be snacks and confections. The work is the creation of Todd Chandler and Jeff Stark and opened September 16th. The opening included a live concert to go with the showing of the 01SJ "Future Films" series. Here's video of them loading the cars into the exhibit, which looks like too much fun.